Most new puppy owners do not realizing that Socializing happens from when a puppy wakes up, until it goes to sleep. It is important to give the puppies new things to explore all day, inside and outside. It is important to set up games for the puppy, and puzzles to solve. But it is also important to teach the puppy to be calm. You cannot force a puppy to be calm. But you can ‘reinforce’ a puppy’s behavior when it is calm. Your puppy will become what you reinforce. The problem is – your puppy is reinforced positively and negatively. This means that you can reinforce a puppy by saying good puppy, petting, playing, and giving a treat. Or, you can reinforce a behavior by yelling, punishing, yanking a leash, or handling a puppy roughly. Both of these will reinforce a behavior. So, be careful that you are not reinforcing behaviors you do not want the puppy to continue. At this stage I start teaching puppies not to bite each other’s faces, or bite my hand. 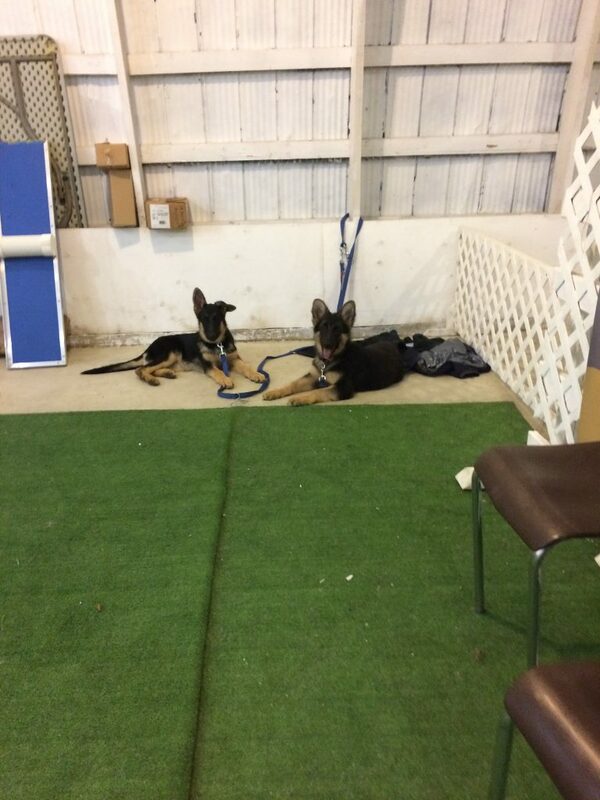 They have already learned bite inhibition at 6 weeks, but now they must learn good manners. I will let a puppy mouth my hand if the puppy is being calm and gentle. But, I will not let a puppy bite me if the puppy is excited. I will stop the puppy by holding it, and then when it stops biting, I will praise the calm behavior. I also start to teach puppies the next level of ‘leave it.’ I will put a bag of treats on the floor between my legs. Then ask them to sit. If they sit I give a treat. There is not punishment for not sitting. Another game I play is holding a treat in both hands. The puppy gets the treat when it looks at me, not it’s hand. When the puppy is practicing ‘sit’ and ‘down’ I randomly make the puppy wait 2 – 10 seconds between treats. I also teach the puppy that when the leash goes tight, we stop walking. One of the main things that I suggest that you never do is to take a puppy on a walk until after the puppy has learned to walk. I start by teaching leash skills at home, at 10 weeks. Then I teach the puppy not to pull. By 14 weeks I will take the puppy to parks, sidewalks, and parking lots. Each area can make your puppy forget that it has learned to walk on a leash. That is okay, it is a normal part of learning for a puppy. Give your puppy time to learn. If your puppy learns to walk calmly before 6 months old, then the chances of being reactive are negligible.